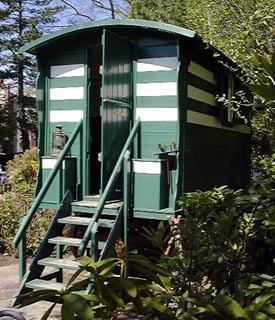 In 2011 we launched a public appeal to raise funds for the restoration of Romany’s famous vardo – proudly known as the smallest tourist attraction in the country and still on outdoor display in Wilmslow. It had been open to the public once a month during the summer months. Despite many minor repairs over the years the Vardo’s condition had deteriorated and it needed a thorough professional restoration. 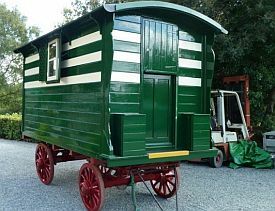 Following successful fund-raising the Vardo was successfully restored – but its future became the subject of some debate. Should it be put back in the memorial garden in Wilmslow, where it had stood for many decades, or should it go elsewhere? The final decision, inevitably controversial to some, and with strong feeling from both sides both within and outside the society, was that it should be moved to a new home, and it is now (from 2013) located at Bradford Industrial Museum. For more information about the vardo visit the Vardo page. The Romany Society was originally formed in 1946, after Romany's death, and continued until 1965. It was re-founded in 1996, with Mr Terry Waite as Patron and Mrs Romany Watt (Romany's daughter) as President. It was created to promote and encourage the study and appreciation of Romany, his life and works. There are over 300 members of all ages. As 'Romany', G. Bramwell Evens wrote over 10 books, aimed at children but just as appealing to adults. Some are available in re-print, and all can be obtained second-hand. Only one radio recording survives and this can now be bought on CD. Details of all the books, and new books about, or in the style of Romany are given on the Books Pages.